The Midnight Review: Romney To Those With Preexisting Conditions: "Let'em Die!" Romney To Those With Preexisting Conditions: "Let'em Die!" "The best thing for the nation is to not do what I did in Massachusetts. Screw the uninsured." Looks like Romney detailed a little more of his federal health care overhaul if elected when on The Tonight Show the other night. But, Leno asked, what if they haven’t been insured? Essentially, Romney believes the preexisting coverage clause should exist with it's set of own preexisting conditions, with those being a person cannot get insurance coverage with an illness unless they had coverage for an unspecified amount of time before then. 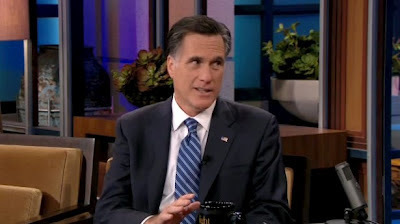 What is the problem with Romneycare 2.0? Health care and insurance prices are ballooning faster then Americans can pay for them. One purpose for the mandate was to keep prices in check otherwise healthy individuals or those not particularly wealthy would forgo insurance until they were sick, placing a burden on insurance companies. Under the Romney plan, insurance and health care costs would still go up, forcing more people to forgo insurance coverage, which would cause more people to fall under the Romney Exclusion clause. Not only that, but take into consideration congressional Republicans saying they have nothing planned should health care reform be struck down by the supreme court in June. Throughout the entire health care debate the GOP claimed they were being ignored and they had the plan to fix America and now here is an opportunity to do something anything and instead they plan on doing nothing and keeping the status quo. No wonder Americans are beginning to wake up from their 2010 mistake and see Republicans as out of touch.